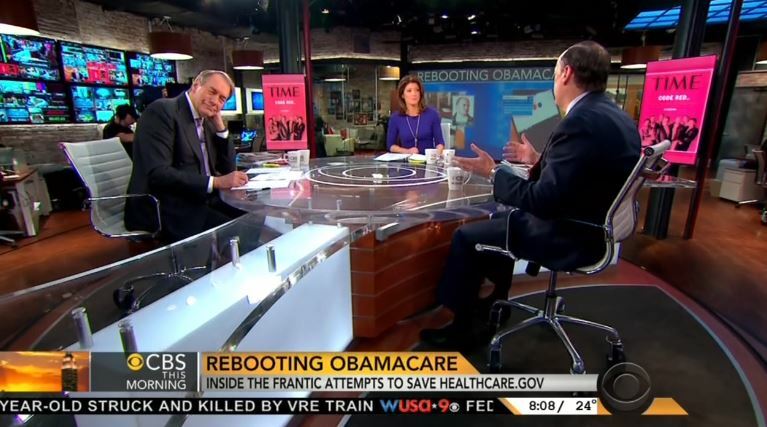 O'Donnell and Charlie Rose talked to Steven Brill, who has written a cover for Time magazine "on the failed roll out of HealthCare.gov and the White House's desperate effort to fix the web site." 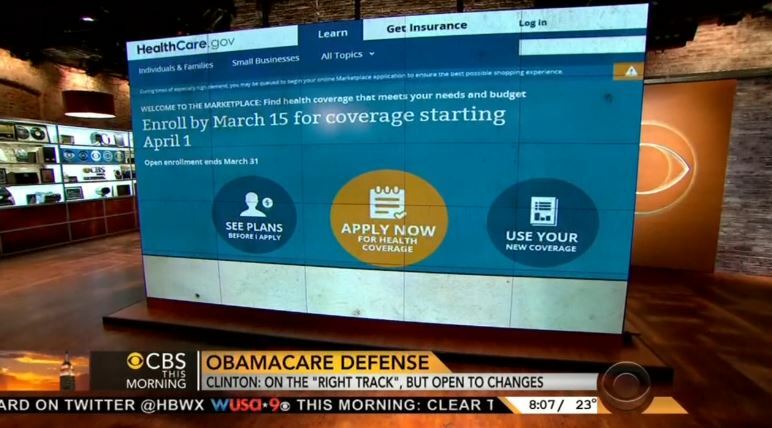 A CBS graphic explained, "Rebooting ObamaCare: Inside the Frantic Attempts to Save HealthCare.gov." O'Donnell summarized Brill's conclusions about an "administration obsessed with health care policy reform but... above the nitty gritty of implementing." She added, "...They passed a bill, but nobody ever thought about how to implement it." Brill did spin the current team working on the website as inspirational and pointed out they worked on Thanksgiving and Christmas Eve. However, CBS should be given some credit for spending four minutes and 40 seconds on addressing ObamaCare's problems. As the Media Research Center has pointed out, the standard journalistic response has been to skip the health care law's failings. The networks refused to report on the spiking of small business premiums as a result of ObamaCare. CBS, NBC and ABC also avoided the news that the law will cost public sector jobs. The devastating job loss predicted by the CBO was disguised as a "hiccup." For more on ObamaCare setbacks, see a report on MRC.org. CHARLIE ROSE: This morning, President Obama's health care law has a, quote, qualified endorsement from former Secretary of State Hillary Clinton. In Florida, Secretary Clinton said, Wednesday, the Affordable Health Care Act is on the right track in many respects but she adds, "if things aren't working, evidence-based changes need to be made." A CBS News/New York Times poll finds half of the Americans agree. They think ObamaCare offers good things but changes need to be made to make it work better. However, 42 percent want the law repealed. Only six percent think it's working well. NORAH O'DONNELL: We have new information this morning on the failed roll out of HealthCare.gov and the White House's desperate effort to fix the web site debacle. Time magazine revealed in its new issue that President Obama considered shutting down the site and starting over. Time contributor Steven Brill reports the cover story. Good morning, Steven. STEVEN BRILL: Good morning, Norah. O'DONNELL: So, how close were was the President to just scrapping the whole thing? BRILL: Well, they were pretty desperate. Two weeks into the launch, as the government shutdown ended, they knew all the attention was now going to be focused this website which just went working. So the President ordered his chief of staff to have a team come in and decide whether they should scrap the whole thing and start over or whether they can fix it. O'DONNELL: The President was furious, right? BRILL: Well, he was furious and everybody in these meetings that he had in the first two weeks was desperate. But they had no information. At these meetings, they literally -- they themselves didn't know if the site was up, except by taking out their own laptops and trying to go on it. O'DONNELL: You write in the piece this is a story of an administration obsessed with health care policy reform but not above the nitty-gritty but above the nitty gritty of implementing. In other words, they passed a bill, but nobody ever thought about how to implement it. BRILL: Well, the people in the White House, at least, you know, for this bill, which is what my reporting was about, they were very preoccupied by the policy decisions, the regulations they where writing and not preoccupied by, you know, the nitty-gritty of actually implementing it. And the government is implementation. ROSE: Is it possible– Well, is it possible to go back and look at it and say, "look, we did not have the right to implement this" and say, "This was your responsibility and you failed it. So, therefore, you should be fired?" ROSE: There's more than one. BRILL: That responsibility, again, if you're running a government or if you're running a business as I have, that responsibility starts at the top. ROSE: And so, the President couldn't fire himself. BRILL: I mean, I'm not a technologist, but I would sure make the technology works. ROSE: It happened on his watch so therefore he's responsible. BRILL: He's responsible. That doesn't mean, you know, the President should be fired. ROSE: So, in the end, do you think health care will be a positive part of the President's legacy? BRILL: Well, I think the plumbing and electricity works in the house and now we get to see if we like living in the house. BRILL: We have to see – Now, the law will be given a chance to work.